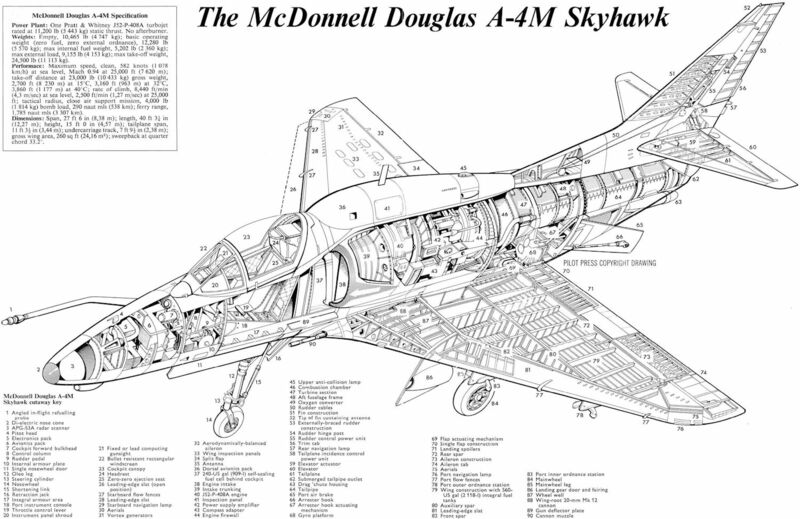 Latest production version of the McDonnell Douglas Skyhawk is the A-4M, shown awaiting delivery. Among the new features are the square-tipped fin, angled refuelling probe, drag 'chute and deepened cockpit canopy. To date, Argentina has received 50 ex-USN A-4Bs, with another 20 to be delivered at the end of this year. 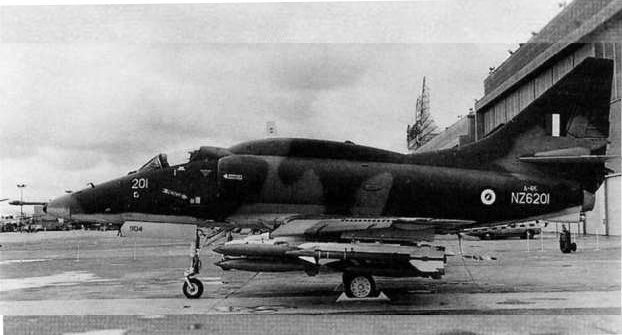 The first batch of 25 were in natural metal finish, but the second batch have a green-and-brown camouflage pattern, illustrated here on two A-4Bs demonstrating the buddy-pack refuelling facility. To date, Argentina has received 50 ex-USN A-4Bs, with another 20 to be delivered at the end of this year. The first batch of 25 were in natural metal finish as shown, but the second batch have a green-and-brown camouflage pattern. 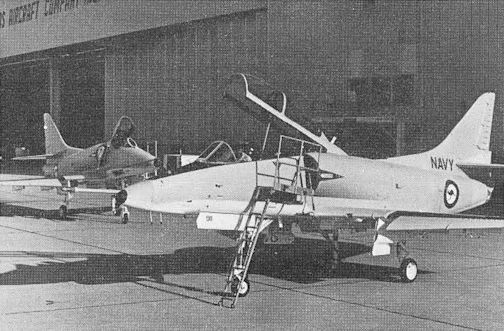 The Royal Australian Navy's A-4G (background) and TA-4G two-seaters are externally similar to the A-4E and TA-4F respectively. An A-4E in Israeli colours, this being one of a batch of ex-USN Skyhawks recently delivered to Israel to supplement the earlier purchase of A-4Hs. A-4G, A-4H и A-4K (включая TA-4G и TA-4K). Модификации созданы на базе A-4F/TA-4F - это экспортные варианты для ВМС Австралии, ВВС Израиля и Новой Зеландии. A-4G приспособили для задач ПВО, убрали надфюзеляжный обтекатель. Израильские A-4H также остались без "горба", получили угловатый вертикальный киль (на нем установили антенны системы "свой-чужой", установленной также на новозеландские A-4K) и тормозной парашют. Израильские Skyhawk в процессе эксплуатации существенно модифицировались, а новозеландские A-4K получили надфюзеляжные обтекатели, хотя в них установили не так много БРЭО. Всего собрали 16 A-4G, четыре TA-4G, 90 штурмовиков A-4H, 10 самолетов A-4K и четыре TA-4K. Позднее уцелевшие австралийские самолеты передали новозеландским ВВС - все машины версий G и К доработали до общего стандарта A-4K Kahu, но в 2001 году их списали. 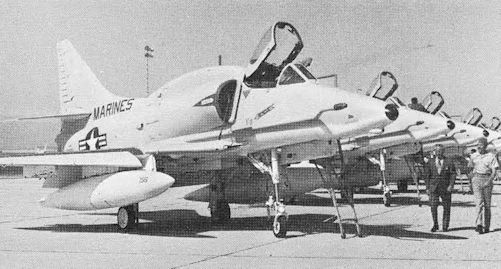 The Royal New Zealand Air Force has eight A-4Ks and four two-seat TA-4Ks in service. The A-4Ks have most of the external features of the A-4M apart from the deepened cockpit canopy. 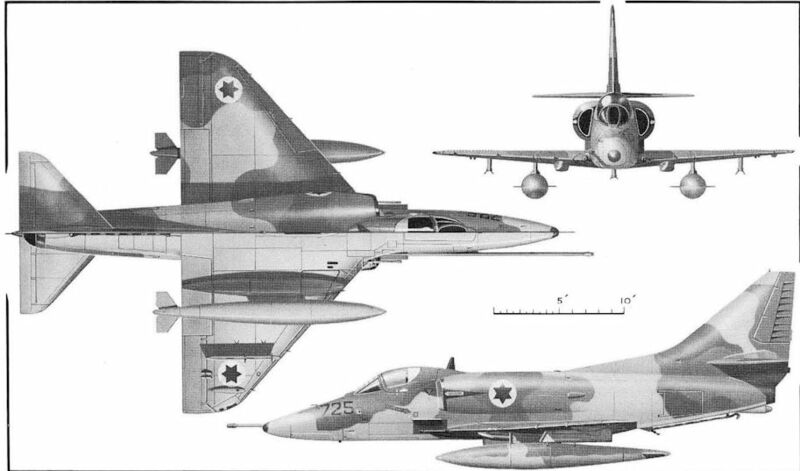 Illustrated from top to bottom are the A-4A; A-4B (with refuelling probe and new rudder) ; A-4C (with lengthened nose) ; A-4E and A-4G (with revised intakes and extra wing strong points) ; A-4F (with avionics pack); TA-4F, TA-4G and TA-4J (two-seater) ; A-4H (square-tipped fin and drag 'chute); A-4K (with avionics pack and square-tipped fin); TA-4K and TA-4H (two-seater with square-tipped fin and drag ’chute); and A-4M (new canopy, square-tipped fin, drag ’chute and short refuelling probe). A batch of ex-USN Skyhawks recently delivered to Israel to supplement the earlier purchase of A-4Hs. It's features shown in the tone drawing, include the drag ’chute and square-tipped fin. Type have 30-mm DEFA guns in the wings and are in course of being fitted with dorsal avionics packs in Israel. 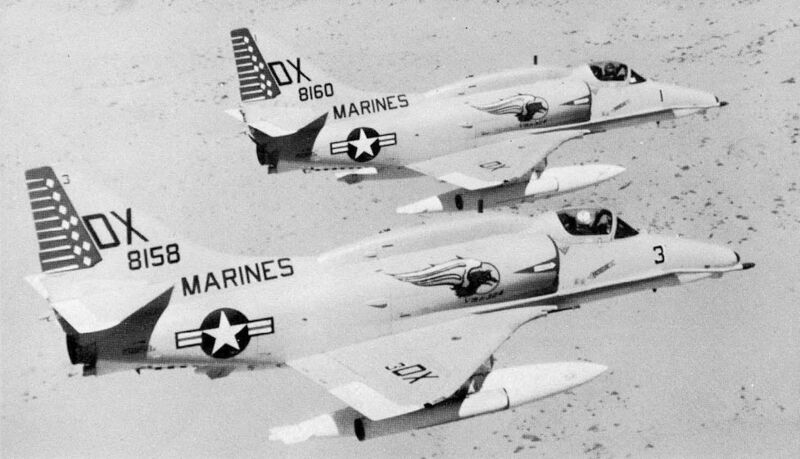 A McDonnell Douglas TA-4F, two-seat version of the Skyhawk, in the colourful markings of Commander Readiness, Attack Carrier Air Wing Twelve, home-based at NAS North Island, California.